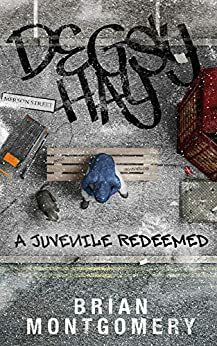 In Degsy Hay: A Juvenile Redeemed, Brian Montgomery sets himself up as a modern day Horatio Alger or Charles Dickens, telling a tale of a hard-done-by young man who overcomes his humble beginnings to become something more. Degsy Hay, born inside a UK prison to a heroin addict, inherits his mother’s chaotic life, as well as a mysterious diary with missing pages. At age 16, he’s released from McAlley-Stoke youth facility with no prospects. He spends a few months on the streets, during which he assembles a small entourage including a three-legged dog named Sadface, a girlfriend (and her young son) and several homeless tradespeople. Before long, though, he’s back in McAlley-Stoke, where, through a mix of violence and charisma, he quickly becomes the Gaffer, the big man in the youth correctional facility. He launches a reform campaign to encourage the young offenders to educate themselves during their incarceration and convinces (via a bloody riot complete with hostage-taking) the facility itself to treat its wards more humanely. All the while, a mystery around missing children and how they’re connected to the missing pages of his mum’s diary builds around him. Montgomery gives his hero/narrator a distinct voice, rife with Cockney slang, locating him squarely in the rough and tumble housing estates of urban London, a lot of “nar’mean” this and “geezer” that. But for all his streetwise exterior, Degsy is a kind soul at heart and looks out for the people around him. It seems that everyone he meets has a lesson to teach him, even if they have to die a grisly death for him to learn it. The people closest to Degsy have a nasty habit of ending up dead, or filthy rich. Sometimes both. For a book that tackles some extremely difficult topics like poverty, addiction, and child abuse, Degsy Hay can be a bit simplistic at times. It seems more concerned with showing how one extraordinary character overcomes these heinous hurdles with a plucky attitude and a few well-placed friends, and yet there’s an internal logic to it too. It’s Degsy himself who tells the story, and so why wouldn’t he place himself at the center and give himself all the credit? On the surface, the story of a streetwise youth pulling one over on the world with nothing more than his wits, a few friends, and a three-legged dog should appeal to middle grade readers, but the very strong language and heavy theme of sexual abuse are better suited to older readers with a bit of maturity to process the trauma at the core of Degsy’s tale. More sophisticated readers, though, might find the very Dickensian style of storytelling a bit old fashioned. But then, we’re still reading Dickens, so why not? At any rate, the colourful language and Degsy’s unforgettable voice should keep them interested.